DiscoverE today announced ASCE members Chad Norvell and Margarita Kovalchuk among its 2017 New Faces of Engineering, Professional and College editions. Both Norvell and Kovalchuk have made community a focus of their early civil engineering careers. 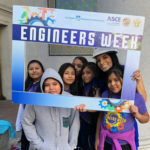 “What you find out quickly is that the engineering is only a small fraction of the work you have to do,” said Norvell, P.E., M.ASCE, a project manager at Nishkian Dean in Portland, OR, who credits his undergraduate years as a volunteer for Engineers Without Borders USA with teaching him about community. Upon graduating from Portland State University, Norvell took on an immense community challenge – three years as director of WorldHaus, a social enterprise that works to provide affordable housing in India. “Ostensibly I was there to design structures and develop new structural systems for the Indian housing market,” Norvell said. “But I ended up surveying remote villages, meeting with community development organizations in urban slums, brokering deals with some of the largest developers in Asia, and resolving labor disputes in the field, among many other things, simply because these things needed to be done to keep our mission moving forward. Kovalchuk, the collegiate New Face honoree, is active in the California State University, Sacramento ASCE Student Chapter, has served as an officer of the school’s Tau Beta Pi Engineering Honor Society, and is president of the school’s Society of Women Engineers section. It was at a SWE event several years ago that she first took an interest in civil engineering. This academic year, Kovalchuk has been researching ways to reduce flood risk in the Sacramento-San Joaquin River Delta through subsidence reversal in constructed wetlands. She will be working on environmental fluid mechanics research at Texas A&M this summer, thanks to a research grant, before returning to Sacramento for her senior year. Norvell, meanwhile, is exploring seismic-risk reduction work, working to protect his hometown of Portland from a catastrophic earthquake. It is a multidisciplinary task – combining technical expertise with social science. 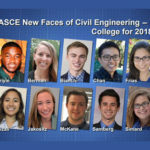 ASCE selected its 2017 New Faces of Civil Engineering earlier this year – 10 talented professionals under 30 and college students. The 2017 DiscoverE New Faces of Engineering counted many civil engineers among the honorees, with Ashley Nichole Evans, India Kaczmarek, Thomas Synovec, Moises Bonilla, and Ashley Cronk joining Norvell and Kovalchuk on the list. See a history of recent New Face winners at the DiscoverE website.